Mikheil Saakashvili is to be deported to Poland declared Ukrainian authorities. His wife is a European Union citizen. “Officials of Ukraine’s migration and border-security services told Saakashvili on Monday he was to be returned to Poland, where he stayed before his most recent arrival, Oleh Slobodyan, a spokesman for the border patrol, said in a Facebook post. Officials used force to apprehend Saakashvili and had to protect themselves from his supporters, he said,” reported Bloomberg. 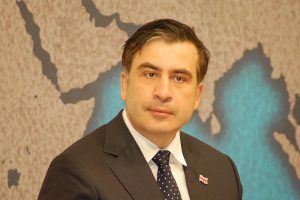 Saakashvili has campaigned feverishly for the impeachment of Ukrainian President Petro Poroshenko since resigning his position of governor of Odessa, citing corruption at the top levels of the Ukrainian government. His political party, The Movement of New Forces, has held multiple rallies in the capital Kyiv, calling for the end to graft and a change in leadership.